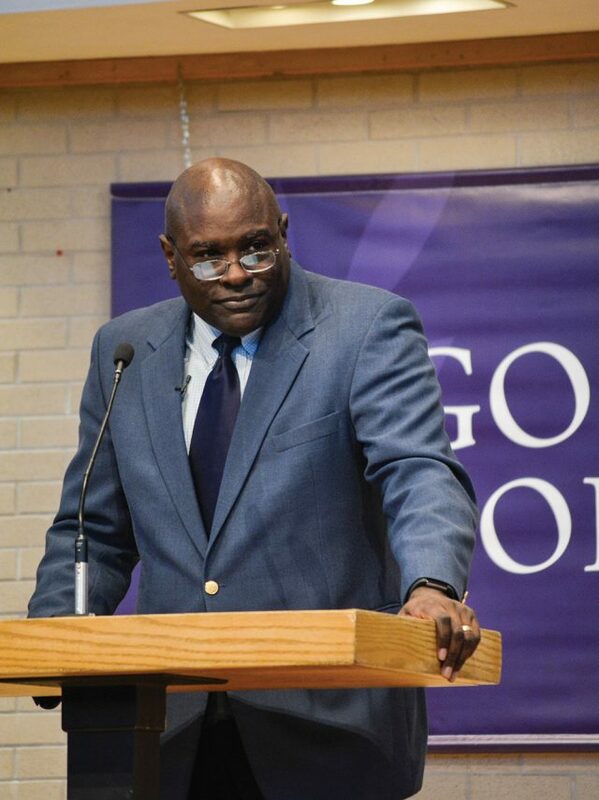 Goshen College celebrates Martin Luther King Jr. Passing of both knowledge and pieces of wood took place this past Monday in College Mennonite Church. The day’s main events included a convocation as well as two Beloved Community (a term coined by Dr. Martin Luther King Jr.) sessions in College Mennonite Church. Both events took place as part of Goshen College’s Martin Luther King Jr. weekend celebration. The convocation took place first, which began with musical performances by Beverly Lapp and Jose Rocha, both professors of music. As they played, students, faculty and community members packed the room. The speaker of the convocation was Leonard Dow, former pastor at Oxford Circle Mennonite Church in Philadelphia and current stewardship and development s pecialist at Everence Financial. Dow’s convocation is the first to be sponsored by the Atlee and Winifred Beechy Peace, Justice and Reconciliation Lectureship. The Beechys were a large part of the Goshen College community as Atlee worked as dean of students, director of counseling services and professor of education, psychology and peace studies, and Winifred worked as a teacher, writer, coordinator of peace and social concerns for the Mennonite Church. Dow walked up to the podium in a blue sports coat and tie, told somes jokes and got a few laughs from the audience to start his speech. Dow followed up the scripture by asking the audience to consider it in a modern context. Dow then drew from the book of Philemon, in which the apostle Paul writes to a slave owner to free his slave. Paul explains to Philemon that the Christian thing to do is to accept Onesimus as a brother instead of a slave. Dow used the book of Philemon to show that when in a relationship with Christ, we need to completely reevaluate our relationships with others. Following Christ means treating others the way that he did. The convocation then transitioned to messages from spokespersons for Center for Healing and Hope and the Poor People’s Campaign. Finally, to conclude, Dow commented on the turn out. Later in the day, Beloved Community sessions took place at both noon and 1:30 p.m. in College Mennonite’s fellowship hall. These sessions began with each person entering the hall taking a small piece of wood from a table with various assortments of wooden blocks. Professor of Kinesiology at Goshen College, Jewel Lehman, shared with participants that one of her hobbies is woodworking. The different pieces of wood she brought came from past woodworking projects she had worked on in the shop in her backyard. She then invited everyone to get up and find others who had the same type of wood as themselves. The tables randomized, and after the people settled, a discussion about community ensued. After a few minutes of discussion, the groups switched again, this time with persons in the room grouping up with those they shared commonalities with, such as department of study, athletics or living situation. The discussion then focused on the strengths each group had to offer the community of Goshen College. Key themes that arose from the discussion spoke of the importance of diversity, togetherness, celebrating differences and building relationships. The session ended with everyone adding their piece of wood to a maple leaf shaped art piece that professor Lehman will take to her woodshop and glue together to symbolize the community of Goshen College.